Throughout her life, Sister Mellitene Grunloh has known the Hospital Sisters of St. Francis. And it all began with a waving hand. She was born on Monday, August 9, 1920, in Teutopolis, IL, to Francis and Anna (Schoenehoff) Grunloh and was named Kathryn. Tragically, her mother died two years later. Soon after, her father moved Kathryn and her sister Clara to his parent’s home in Green Creek, IL. When Kathryn was six years old, he remarried, and soon after, a brother and sister were added to the family. “Sadly, when I was eight years old my father died,” Sister Mellitene explained. “My stepmother reared me and my siblings in nearby Effingham, IL, in a house on Virginia Avenue behind St. Anthony’s Hospital. Many of my childhood memories are centered on the comings and goings at the hospital. Most notably, at 1 p.m. we would hurry to our back porch so we could wave to the Sisters who were going back to their time of recreation following lunch and prayer. When Kathryn turned 16 years old, she began working long hours in the kitchen at St. Anthony’s Hospital. “I loved working with the Sisters as I saw first hand how they cared for the patients. After three years of working there, I realized that God was calling me to religious life,” she said. 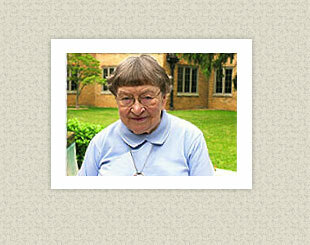 She made her First Profession as a Hospital Sister of St. Francis on June 13, 1942. She completed her high school education at St. Francis Convent and later earned a bachelor’s degree from Quincy University and a master’s degree from Marquette University. Of everything she’s learned in her religious life, the most meaningful thing for her “is in regard to how I pray. I have learned that praying with the mind of a child - giving thanks for the little things like the sun or the singing of birds, to the assurance that God’s guiding hand will be with me - has brought me comfort,” she explained. “And to those who read this story, be assured of my prayer that God will give you the gift of respect, compassion, and kindness for others,” she said. “God is ready to help you – all you have to do is ask,” she concluded.